I hope you’ll tune in! What are your favorites of Tic Tac Trance #018? 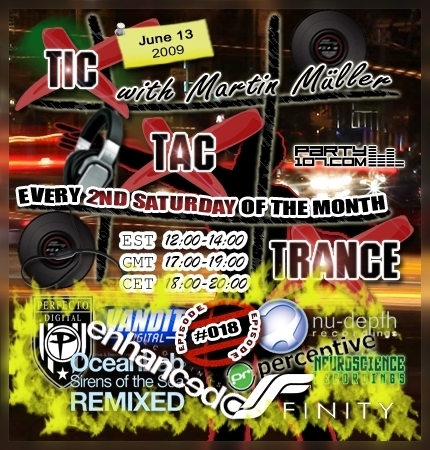 The 18th installment of Tic Tac Trance airs today on Party107.com! This episode will feature a 2 hour mix with upfront & uplifting tracks, brought to you by labels like Vandit, Perfecto, Enhanced, nu-depth, Perceptive, Neuroscience, Finity and many more. Furthermore I’ll spin some tunes from Sirens Of The Sea Remixed album by OceanLab! This time the webvote will be back and you can vote for up to 3 of your favorite tunes after the show. The winner will be played in the next episode of Tic Tac Trance! I finally found time to create my own Facebook profile! From now on you’ll find there additional information to the show and some random posts from me there. Direct replay links of upcoming shows will be added there aswell. So make sure to check it out!